—Protest signs carried by AFL-CIO members outside a Las Vegas hotel where Romney’s running mate attended a private “finance meeting” with Republican donors, including billionaire casino magnate Sheldon Adelson. Adelson has poured $36 million into conservative super-PACs and has said he’ll spend as much as $100 million to defeat President Obama. An attendee told the New York Times that he “saw no dialogue between” Ryan and Adelson. 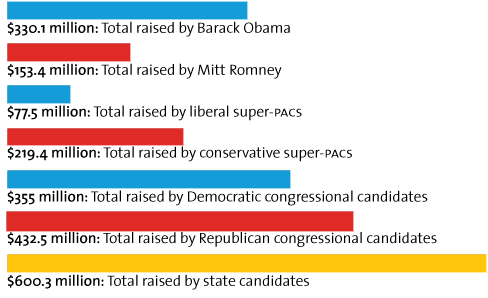 Two: The number of 501(c)(4) nonprofits that, combined, have spent more than all super-PACs combined. 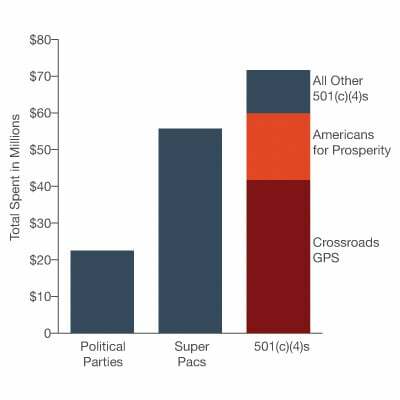 ProPublica reports that Karl Rove’s Crossroads GPS and the Koch-affiliated Americans for Prosperity have spent nearly $60 million on television ads, compared with $55.7 million spent by super-PACs, and $22.5 million spent by political parties. • Can Harold Ickes Make It Rain for Obama? : The Democratic operative has cussed, clawed, and outsmarted his way through three dozen elections. His new fight: Stop Karl Rove and Co. from steamrolling the president. • The Reformers Strike Back! : The conservatives behind Citizens United have lost some key fights lately. But another battle over corporate money in politics looms. • Karl Rove’s Dark Money Group Busted for Bogus Ad: Crossroads GPS says it proactively pulled the inaccurate ad. Well, not quite.